The 30+ hour bus ride from Tuzla, Bosnia to Copenhagen, Denmark was a long one, but it was an enjoyable journey across six European countries (Bosnia and Herzegovina, Croatia, Slovenia, Austria, Germany and Denmark). I was dumped by the bus company at a remote stop just outside the Copenhagen city center. From there, I cycled across town, through some of the city’s most famous tourist sites, to a large campground located on the city’s western edge – Bellahoj Camping. After my first night in the campground, I spent my first full day in Copenhagen exploring the city by bike. I visited “The Marble Church” (also known as “Marmorkirken”) and the Amalienborg Palace. I cycled past Frederiksborg Palace and through several large parks filled with happy, blonde-haired families and fair-skinned sunbathers. Copenhagen wasn’t nearly as crowded as I thought it might be. It was much more casual than I imagined, and I liked it overall. After an entire day of cycling around the Copenhagen city center, I returned to the Bellahoj Camping ground on the western edge of the city, and was shortly thereafter joined by a young couple from Spain who were also traveling around Europe on their bicycles. I had been feeling a bit down (unmotivated to cycle across Scandinavia, perhaps?) when I first arrived in Copenhagen, so having Pablo, Ana and Hippie join me on the bike ride north toward Oslo was exactly the lift-me-up I needed. Cycling out of Copenhagen, Denmark was incredibly easy, as there were tons of separated cycle paths to follow. One such path took us through a small nature reserve where school children were playing outside in the rain, catching frogs in nets, and learning about the local environment. After only an hour or two of cycling, we met up with a Spanish reader of the Bike Canine website who just happened to live in the area north of Copenhagen. We stopped in a fancy coffee shop and chatted, while waiting for the rain to stop, and drinking the most expensive hot chocolate I have ever had in my life ($12 USD). Denmark is not cheap! After the rain stopped, we jumped back on our bicycles and started pedaling north toward Helsingor, Denmark, where we planned to jump on a ferry boat and travel to nearby Sweden before nightfall. Luckily, getting around in Denmark is as easy and as enjoyable as everyone says it is. The country is flat, with bike paths leading in every direction, alongside nearby every single road. A few kilometers before taking the ferry boat over to Sweden, we stopped at a small, idyllic beach and played for a moment in the water with Hippie, while snapping photos of both her and ourselves on a small nearby pier. After successfully crossing from Denmark to Sweden on the local ferryboat, we cycled out of Helsingborg, Sweden and into a small forest north of the city, where we pitched out tents, made a campfire, and did our best to stay dry from the falling rain. It rained all morning the following day, so we stayed inside out tents until nearly noon, and as soon as the rain stopped, we packed up our things and began cycling north. The night of our first full day in Sweden we spent camped out in a large forest near the city of Bastad, Sweden. This was probably our best campsite that we had during our time in Sweden together. Pablo and Ana cooked us all a delicious vegetarian meal, and we sat beside a large campfire as the sun set through the forest of trees surrounding our campsite. I was happy to be in Sweden (as I had been looking forward to seeing the country for quite sometime), but I was even more happy to have such great company. Pablo and Ana were a joy to be around… and traveling with Hippie sure made our cycling trip that much more enjoyable. One of the things I liked most about traveling with Pablo and Ana was that they moved slowly (and I mean that in the best possible way). They weren’t in a big rush to get anywhere… and it gave us all the ability to truly enjoy the places we were passing through. My first impressions of Sweden: Lots of retirees driving gray Volvo station wagons through flat, rolling, quiet farmland. It seemed as though there were hardly any young people in Sweden… and one out of every three cars on the road was a Volvo. One out of every two cars was a station wagon! 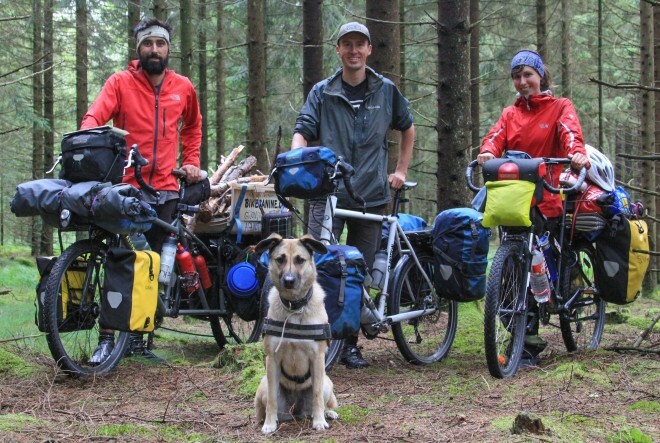 Bicycle touring with a dog in tow was a unique experience. When Pablo and Ana and I would approach people on our fully-loaded bicycles, we’d at first be greeted with suspicious looks. But as soon as people would see Hippie (the dog) riding in the basket on the back of Pablo’s bicycle, they’d smile big smiles, laugh and sometimes even stop to ask us about our travels. While the weather in Sweden was often very cold and windy, we did experience one or two beautiful days of summertime cycling in the country. Sweden seemed like an almost entirely different place (a much better place, in my opinion) when the sun was out and the sky was blue. Ana was a strong traveler and I really enjoyed talking to her about here life – both before and during the bike tour she was on. She and Pablo met in a bar where she used to work, and he had somehow convinced her that she should come on a bicycle trip with him. While many women would consider doing such a thing to be out of the question, Ana seemed incredibly happy with the decision she had made. She wasn’t looking back. Instead, she appeared to be looking forward to whatever the future might hold. Pablo’s Surly Big Dummy touring bicycle was so loaded down with gear than whenever he his even a short hill, he’d tell Hippie to jump out of her basket on the back of his bicycle and run alongside. Doing this in most instances was not a big deal, but in high-traffic areas I personally feared for the safety of both Hippie and Pablo. I found it amazing to think that Pablo and Hippie had traveled this was to Sweden all the way from Spain! Our fourth night together, Pablo and Ana and I cooked a huge Mexican burrito inspired dinner over a campfire in the woods. I had been telling Pablo and Ana how much I was missing the Mexican food I had grown up with back in California, so they decided that we should try cooking some Mexican food that night. The burritos tasted really good, and I was thankful once again to have such great people in my company! The following night, now just a few kilometers south of Gothenburg, Sweden, Pablo, and Hippie and I discovered a small wooden shelter situated on the edge of a lake in a hillside community nature park. I was hesitant to camp here at first (because of all the walkers and runners going past), but eventually settled in and was happy to have made this beautiful place my home for the evening. We made another large campfire that evening and enjoyed sitting on an actual picnic table while we ate our dinner. Every night, I’d pull out my laptop and look at the photos I had taken from the day. I’d make any necessary edits, upload the photos to my smartphone, and then post the pictures I had taken to Bicycle Touring Pro’s various social media channels. Pablo and Ana were also active on their smartphones and iPad during our travels together… and it was nice to be traveling with people who understood my desire for a high-quality Internet connection. Only July 13, 2015, Pablo and Ana and I cycled a short 15 kilometers or so into the city center of Gothenburg, Sweden. Once there, we navigated our way to a tall apartment building, inside of which lived a friend of Ana’s from Spain. Marga, her husband Bruno, and their new baby Blanca welcomed us into their home. We set up camp inside the community guest/party room of our hosts’ apartment building. Once there, we dried out our wet belongings, charged up our various batteries, took much needed showers, and washed all of our dirty clothes. While Pablo, Ana, and Hippie and I had originally planned to cycle all the way from Copenhagen, Denmark to Oslo, Norway together, Pablo and Ana decided that they were doing to stay in Gothenburg for a while longer (maybe a week?) and that they’d meet up with some other friends of theirs in Oslo in about two week’s time. I, however, needed to get to Oslo by July 20th in order to meet my friend Eric Kiraly, who would be joining me on the next leg of my Scandinavian bicycle touring adventure. So, on the morning of July 14th, I packed up my things and said goodbye to my Spanish travel companions. It was kind of weird to be cycling on my own again. I felt naked and timid cycling out of the city all on my own. But it didn’t take long for me to get back into the zone – traveling on my own, at my own pace, and doing as I please. My first day of solo cycling in Sweden was a good once, despite the strong winds. I crossed a series of small islands (Kallon, Almon, Almosund, etc.) and then spent the evening camped out in a forest on one of the larger islands in the area. I pitched my tent on the far side of an old stone wall, built a small fire, and laid in my tent listening to podcasts on my smartphone as the sun set late in the evening sky. At around 1 AM, I was awoken by the sound of a large animal running through the forest, directly toward my tent. I jumped out of my sleeping bag, stuck my head outside the tent, peered through darkness and saw a large, red deer (more the size of a small elk, however) standing just a short distance away, bouncing back and forth in fear on the rocks near my campsite. The animal grunted and snorted, making a sound similar to what you might expect to hear from a bear, and then I heard similar noises coming from the forest all around me. I was surrounded by at least three or more of these large animals! I tried shooing them away with my noise, and when that didn’t work, I threw rocks into the darkness (hoping to scare them away). Nearly fifteen minutes passed, and the animals remained, snorting and calling to one another, but certainly not retreating. Finally, I grabbed the emergency whistle I carry with me on my backpack and give the whistle four short, but extremely loud, blows. It was then, finally, that the deer ran off, retreating into the wood. The next morning, the sun was out, but the wind was blowing. The weather wasn’t perfect, but it was a generally beautiful day. I listened to music while I pedaled and then made camp early in an area just off the road. I picked wild strawberries for dinner and was rocked to sleep by the sound of cars driving past on the nearby motorway. The following day (July 16, 2015), I pedaled a considerable distance to the city of Stromstad, Sweden. This seaside tourist town is the last major city I would come across before crossing into Norway, so I wasn’t surprised to see that the city was full of tourists. Sweden, I would soon learn, is far less expensive than Norway. So many Norwegian families come to this cozy seaside community for an inexpensive summer holiday. I spent two nights camped out in a rocky forest area just outside the Stromstad city center… and spent my first rest day since arriving in Scandinavia at the local library – catching up on emails and various computer work. I’ve gone bicycle touring all around the world, and it’s not that common to come across other long-distance bicycle tourists. But in both Sweden and Norway, seeing other traveling cyclists was an almost everyday occurrence. Even though these two countries are some of the most expensive places to visit in the world, I imagine people come here because of the high-quality bicycle infrastrure, the flatness of the roads, the fact that so many people speak English, and the fact that it is so incredibly safe (even for solo female travelers). What does it look like to cycle across the area north of Sweden and south of Oslo, Norway? Well, it looked a lot like this (see the photos both above and below). The land is largely flat, with lots of small, rolling hills covered in forests and farms. Small farmhouses dot the countryside and houses of all shapes and sizes can be seen as you cycle along well-kept roads and separated cycling paths. I thought that cycling in Norway would be much more remote than it actually is. There are not huge stretches of land with nothing in between. Instead, the people and communities are spread out… and much like the rest of Europe, there are people and resources in nearly every direction. On the evening of July 19th (just one day before I would meet my friend Eric Kiraly at the train station in Oslo, Norway), I cycled down a long, steep mountain road, carried my bicycle through some deep brush, and then set up my tent on a hillside overlooking a large lake. This would be my last night of solo bike travel for the next month or so, as I’d be in the company of my friends Eric, Rob and Katelyn for the next several weeks. That night, I spent a good half-hour picking wild blueberries in the forest, while gathering them up inside my sunglasses case, and eating the entire bunch with my dinner that night. Even though food (and so many other things) in Scandinavia are extremely expensive, there are certain things (like the free berries you can find in the forest) that are free for the taking. The following morning, I slept in late and the packed up my bicycle. The road into Oslo was flat and enjoyable… and a whole lot easier to navigate than I thought it might be. Cycling into large cities is often a huge hassle, which involves navigating through traffic and cycling on dangerous city streets. But the road/path into Oslo was almost entirely on a signed and separated bicycle path that rang along the waterfront. I reached the city center of Oslo, Norway sometime around 1 PM. But my friend Eric (who was flying in that day from Los Angeles, California, USA) wasn’t scheduled to arrive at the Oslo airport until around 6 PM. So I wandered around the city center for a few hours, taking in the many tourist sights and doing a fair share of people-watching. The man you see in the photo above (on the left), staring at the statue of the man with a bicycle (on the right), told me that the man with the bicycle is staring at the Nazi soldiers walking past on the road in front of him, as they were retreating from the city during the Nazi occupation of Norway in 1944 (or 1945). After several hours walking around Oslo with my bicycle in tow, I found a small park on the north side of the city where I was able to just sit down, read a book and listen to a few of my favorite podcasts. Around 6 PM, I received a message on my phone from Eric Kiraly, saying that his flight had landed and that he was on his was to the Oslo Central Train Station. My bike tour from Copenhagen, Denmark to Oslo, Norway was now complete. I had cycled across three Scandinavian countries (Denmark, Sweden and Norway)… and now the next major leg of my travels was about the begin! Stay tuned for the next installment of my Scandinavian holidays – a ten day self-guided bicycle tour across Fjord Norway with my friend Eric Kiraly and a Norwegian tour company called Active-Norway.com. This entry was posted in Bicycle Touring Pro Articles, Darren Alff's Bike Tour Blog, Denmark, Europe, Locations, Norway, Photos, Sweden and tagged ana, bicycle touring pro, bicycle touring with a dog, bike canine, biking with dog, campfire, copenhagen, cycling with a dog, cycling with dog, darren alff, denmark, denmark bike tour, dog, gothenburg, hippie, how to carry a dog on a bicycle, norway, norway bike tour, oslo, pablo, pablo and ana, scandinavia, scandinavia bike tour, spanish bicycle tour, sweden, sweden bike tour. awesome adventures and really nice photos. Yes, Sweden is expensive when you’re a vegetarian. But camping is for free ( Allmäns Rätt, all mens right) I’ve cycled almost 20 years through Sweden, this year also Finland ( Helsinki up north to Rovaniemi) and down south from Gällivare to Jönköping.But first I did Germany, Poland and the Baltics; these last states because I red your blogs about them. Poland is cheap, lots of forests to camp in the wild. And how CATHOLIC they are !!!!! Glad to read you like Europe and the Europeans. Did you ever feel the need to carry a gun 😉 ? That’s great that you’ve been able to do so much bicycle touring Henk. I’m glad I could inspire you in some way… and encourage you to go to places you might not otherwise visit. Yes, I like Europe… and no, I’ve never felt the need to carry a gun. Not in Europe… or anywhere in the world. Enjoyed the story and photos of your trip so far. I like Sweden a lot especially in the south. Beautiful beaches along the coast between Ystad and Simrisham and great country roads to cycle on. Don’t know if you’ll be cycling down that way but you can also catch ferries from Ystad to Poland and from Malmo to several countries. This is your best story. Great fotos and you spanish comrades! Darren – I have just discovered your website and blog and have listened to your many videos on youtube and have been watching some of your videos with my husband. He and I would love to start doing some bicycle touring with our 8-yr-old daughter. So, your website is just fantastic and is truly a treasure trove of time-tested advice! Congratulations to you! Your videos and advice and writing is all so very clear and well done! Kudos! I was just saying to my husband that it would be so great if you could also consider writing for families like ours who are keen to start bike touring with kids. Finally, if you’re still in Oslo, just let us know. We’ve lived here for 10 years and can also give you some advice and would be more than happy to have you over for dinner or to camp out on our couch. 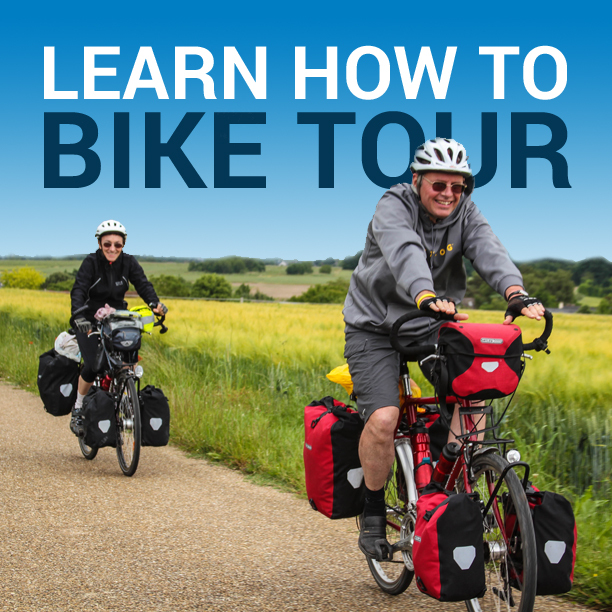 Thanks so much Laura… and welcome to Bicycle Touring Pro! I’m happy to hear that no only you, but your husband and daughter are also considering a trip by bike. That’s truly wonderful! I guess the reason I haven’t written much (if any) about bike touring as a family is because I don’t have a family myself. But I do know of several families who have or are currently traveling the world by bike, so maybe I can feature some of them on the website in the future. Thank you for the recommendation… and I’ll add it to m ever-growing “To-Do” list. You are right about Denmark, pricey and flat. Well, not completely right about the flatness. The road along Oresund (to Sweden) is generally flat but some parts of Denmark can be very hilly, e.g. the central part of Jutland as well as the southern part of the island Funen. Rumours tell that Denmark is as plain as Netherlands which is not true! Hope to see you around in the Danish hills someday! Best cycling story indeed. I really enjoyed reading this awesome traveling story of you guys. Bike riding is an amazing experience and I was planning to go for a similar trip with my friends. You guys are inspired me. Those images are taken nicely and looks good.